This market selling vintage books, specialist magazines, signed editions and hard to find prints and maps has been in existence at Southbank (near Waterloo Bridge) since 1982. I am in Paris at present so will try and catch up with you all later in the week. I've been in that market under the bridge by the NT. But I've learned my lesson about buying books while on vacation. Everyone gets to go to Paris but me. Oops, I forgot to mention that the photo is very effective. I hope it wasn't raining on all those books! Have fun in Paris! Enjoy your trip. Hope you got a good book to read! Have fun. I could wander around here all day. What a neat idea! I would definitely spend hours at a time here. Doesn't the damp air damage the books? Or are they in protective covers? What a dream going through all those books under the opne sky: great photo! Hope you're having agreat time in Paris. Au revoir! A. 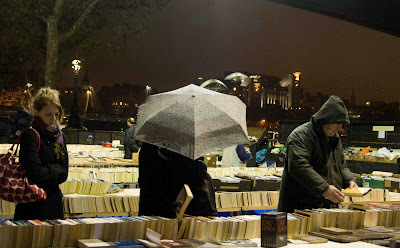 In Paris you can buy some books in english (I think) on the boards of Seine River. Have a good time in my town. Looking forward to hearing about your trip to Paris. I haven't been there in years and miss it.